Late summer and early autumn. Flower-heads: composed of tubular and ligulate flowers, or ray and disk flowers. The rays purple, blue or white and the disks yellow. A. spectabilis, low showy aster, is one of the prettiest of the aster family. It is not so tall as its proud relatives of the swamps; but its ray-flowers are longer and of a violet purple that any monarch might envy. It is the beauty of the sandy soil all along the coast from New Hampshire to New Jersey and southward where it lifts its regal head until the frost-biting breath of winter causes it to languish. The leaves are long and pointed. A. multiflorus, white wreath aster, Plate CXXXIII, is the little white one that skips along the sandy soil with A. spectabilis. Its flower-heads are about one-half an inch in breadth, very numerous and very pretty. They have a crisp, pert expression that enlivens many a bunch of their more pretentious sisters. The upper leaves are linear with a broader clasping base. 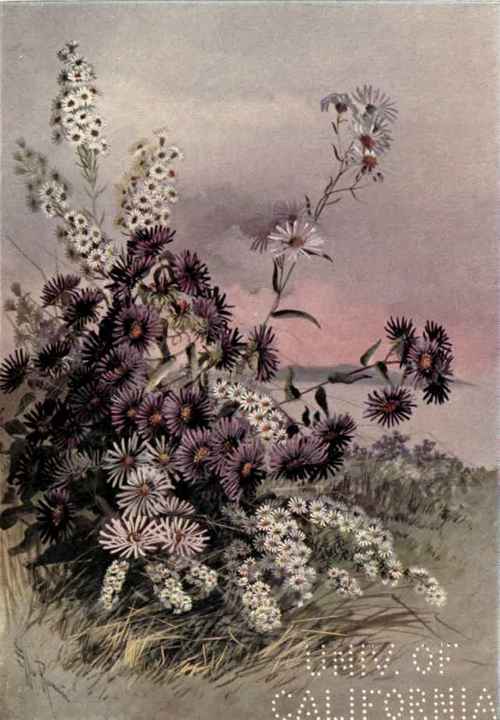 A. surculosus, creeping aster, and A. gracilis, slender aster, are two violet species that are generally found from New Jersey southward. The pappus of each of them is nearly white.